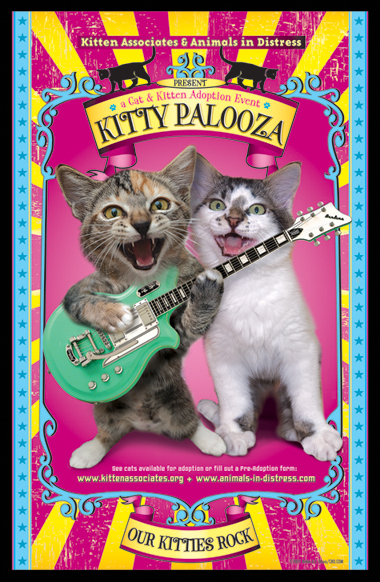 JOIN US AT KITTY PALOOZA! 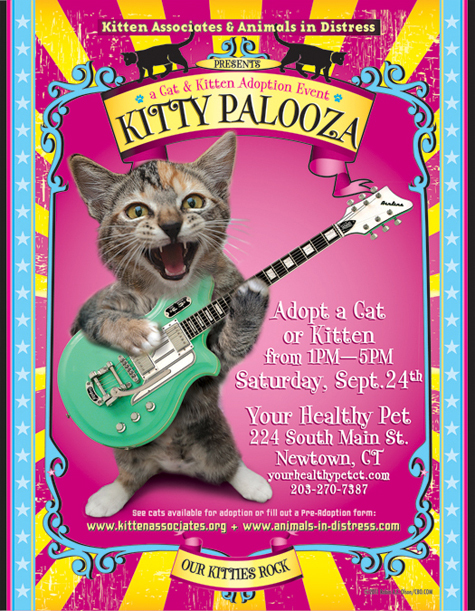 My rescue group, Kitten Associates, partnered up with our friends, Animals in Distress to bring you, Kitty Palooza, our cat & kitten adoption event! I know most of you don't live in the area, but I thought you'd get a kick out of the flyer I designed for the event. It features Amberly's daughter, Blaze! She really knows how to rock! Next week, we'll be selling our limited edition 11" x 17" posters that commemorate the big day! I'll be giving you info on how to order if you're interested! The poster is below. All proceeds will go to Kitten Associates! Wow! those are really neat fun posters? Did you do them? Photoshop I am guessing as well. They look great!